As we start another week, what is it that you are afraid of? What is keeping you from doing the miraculous, the amazing, the incredible for the Kingdom of God? 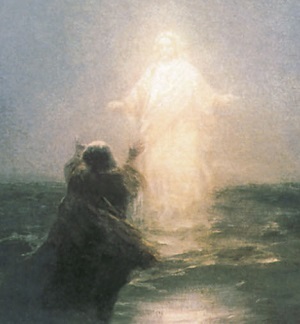 Peter could step out of the boat and take a few steps, until he became fearful – even when Our Lord was right there in his presence doing the impossible! There are always scary stories on the news. There will always be uncertainty and plans gone awry, especially on Mondays. There are always waves, big and small. But what you fear is what you worship. When you hesitate, catch yourself and ask, “Am I afraid of falling short of what Christ called me to do, or am I more afraid of _______?” If the answer is ever the latter, do everything you can to switch your focus to your King!